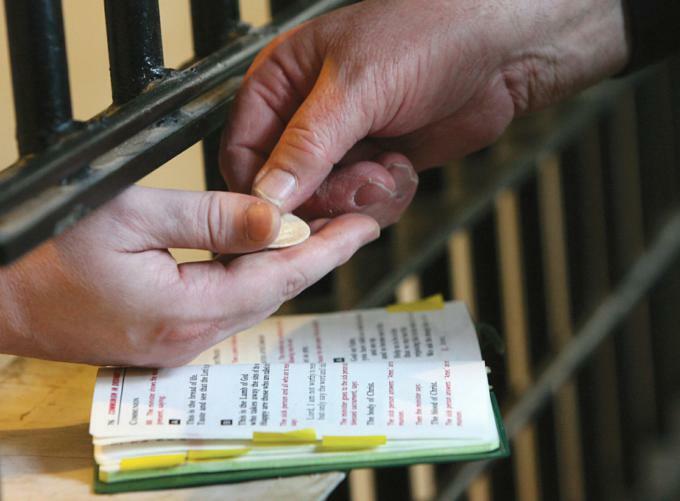 Currently, I am the Catholic chaplain at North Central Correctional Institute (NCCI) in Gardner. If it wasn't for the human and spiritual formation that I received at the Theological Institute, my job would be extremely difficult. But thanks to the education and formation I received, I now look at my brothers with the eyes of Christ. I often think of Matthew 25:36-40 -- "I was naked and you clothed me, I was sick and you visited me, I was in prison and you came to me...."
I am able to sit with the men who have done the unthinkable and are deemed by many as unforgivable and disserving of any possible added punishment beyond that appointed by law. This is but a human reaction. Thanks to the education and formation I received at the Theological Institute, I am able to look at these men and treat them with compassion. I pray with them and walk with them on their journey. Each of them has a different journey and a different past, but many times we are all too quick to judge them on their circumstances, not on their human value. I don't strip them of the dignity they deserve as children of God. They can be seen as good men who did something wrong; a desperate heart who wants to be loved and treated with the dignity of the human person; a child of God who at times is drifting around looking for a place to anchor and call home, a place to be heard, a place where the heart feels at home. I offer them that anchor in Christ. I give them the lifebuoy of salvation and forgiveness that they look for. I become the ear that listens but does not judge; rather, I offer hope not condemnation, joy not despair, and love not hate. If I did not have the teachings of the Church instilled in me through the Theological Institute, I would not be able to do my job. Spiritual formation at the Theological Institute was the aspect that I was mostly impacted by. Getting to know, love and serve God as a Theological Institute-formed lay minister is a journey that has laid in me a solid foundation and given me the necessary tools to work toward a deeper relationship with Christ and with God our father. All the classes are extremely important, and they all go hand-in-hand for complete formation. However, pastoral care was the class that shed light on the entire program and brought it all together in caring for souls. My job requires compassion, love and forgiveness; I thank God for the skills and abilities he has given me so that I may be a compassionate caregiver for souls. JOE JORGE IS THE CATHOLIC CHAPLAIN AT NORTH CENTRAL CORRECTIONAL INSTITUTE AND A 2017 GRADUATE OF THE MASTER OF ARTS IN MINISTRY PROGRAM OF THE THEOLOGICAL INSTITUTE AT ST. JOHN'S SEMINARY.